As the seasons change and the leaves turn brown, memories start coming back. Growing up in Michigan there was 1 tradition we had every year around fall time. We would go to a pumpkin patch and pick out the pumpkins we would carve that year. I’m using “carve” loosely here because I’m about 20 pumpkins deep in my carving career now and I still have no idea how to carve a decent looking pumpkin. I normally settle for a standard triangle eyes, square nose type of deal… One year I got really wild and tried giving my pumpkin a tooth(going for a hillbilly look). Turns out the tooth can’t just float in the middle of the pumpkins mouth, it actually has to be attached to the rest of the pumpkin or else it just falls off. Lesson learned! So by this point I had pretty well settled into my role as a below par pumpkin carver, but I was just finding my true talent. I was a well above average donut consumer! After me and my 2 sisters rounded up the group of pumpkins we would collectively massacre that year, we popped on over to the apple cider and donut stand. Boy were these donuts incredible! Just your basic cinnamon sugar cake donuts, but for some reason they have stuck in my mind all this time. It might be the fact that I’d only have them once a year, but this is truly one of my favorite food memories. We would get a dozen and they’d be gone in a matter minutes. When fall rolled around this year I set out on a mission to create keto donuts that could bring me back to that Cider Mill in Michigan and I think I’ve done it! Made with relatively “whole” ingredients. There are not many things you can’t pronounce on the ingredients list. Not gluten free! Most keto recipes are gluten free just as a byproduct of being low carb. Carbquik contains a few wheat derived ingredients. Contains Soy! Not a big concern for most, but worth noting. High Fiber. 14g of fiber per 1/3 cup. Something you’re going to want to keep in mind when you dive into a swimming pool of keto donuts and eat your way back to the surface. I’d recommend for anyone on a keto diet to pick up some carbquik. It’s the closest thing to actual flour you’re going to find and it’s fun to mess around with and see what you can come up with. You can really take the basic batter recipe and run with it. Mess around, add in different things, try your favorite flavor combinations, etc. The donut batter remains unchanged for the most part, with a few exceptions. It should be noted that the consistency of this batter is very close to a traditional donut batter. It’s slightly looser and is hard to form into exact shapes when dropping in the oil, but it usually fries up into a nice looking munchkin! We use a double spoon technique for dropping the batter into the oil. One spoon to grab a scoop full and the other to push the batter into the oil. The oil! We use canola oil due to it’s high smoke point and neutral flavor. Canola oil isn’t the most healthy but we feel it has it’s uses and this is one of them. You could also use coconut oil but that will obviously not be as neutral in flavor. We’re starting you out with training wheels. This is by far our most basic and classic donut, and in my opinion one of our most tasty. You can’t mess with tradition and this is the perfect example of that. The cinnamon sugar donut is just our standard batter recipe fried to perfection and rolled in a mixture of cinnamon and erithrytol immediately after coming out of the oil. We’ve gone back and forth on this recipe. We’ve tried it with maple syrup in the batter, we’ve tried dipping the hot donut in maple syrup, and we’ve tried letting the donut cool and drizzling maple syrup over top. Based on our trial and error I would advise against the syrup in the batter. It throws the consistency off a lot and makes the donut much lighter and for some reason sort of eggy tasting. The one thing we do have down however is the method for our maple bacon topper. Cut each slice of bacon into 4-5 pieces. Fry it in a pan until crispy. You’re going to want this bacon crispy to hold up to the onslaught of maple syrup coming it’s way. When the bacon is crisped to a point you are happy with, turn the burner off and add in the maple syrup. Allow it to carmalize onto the bacon for a few minutes and set the bacon aside until the donuts are ready to be topped. We were pleasantly surprise with the outcome of this donut. We didn’t add a whole lot of additional sweetness which allowed the chocolate flavor to shine through. We modified the batter on this one by adding cocoa powder to it. This produces a more dense keto donut, but not in a bad way in a moist and delicious way. The topping for this double chocolate keto donut is a 100% cocoa drizzle. Take a 100% cocoa bar(usually labeled as baking chocolate and can be found in the baking section) and melt it down with some erithrytol. You can use a double boiler if you want to be official, we just put it in the microwave and that worked fine. Drizzle liberally over the double chocolate donuts. Best for last! This one was unanimously picked as our favorite. We really nailed the flavors this time. Pumpkin Pie spice is added to the batter which gives these donuts that signature fall flair. We didn’t stop there though. A delicious pumpkin pie cream cheese filling is jammed into the center. The filling contains pumpkin puree, cream cheese, pumpkin pie spice and liquid stevia. To get the filling into the donut your best bet is to use a pastry bag with a steel tip. We didn’t have that so we used a squirt bottle. It’s not ideal but it gets the job done. These donuts are truly magical and if you only want to make 1 flavor I would highly recommend this one! The recipes for all of these are listed below. We love to hear feedback on any of our recipes that you try. If you try out a new flavor not listed here, let us know what it is and how to make it! We love trying new recipes almost as much as we love creating them. We also encourage you to check out our youtube channel if you are interested in learning more about the keto diet. Thanks! The recipe for the Plain Donuts makes 15 donut holes. The ingredients listed for each variety of donut are ingredients needed IN ADDITION to the plain donut recipe. Those ingredients are also listed for 15 donuts. Enjoy! Heat a small pot of oil over medium heat. Allow this to preheat for 5-10 minutes to it is fully up to temperature. In a bowl combine all of the dry ingredients and mix together. With a hand mixer combine all the wet ingredients. Add the dry into the wet ingredients and continue to mix with a hand mixer until you have a uniform batter. Drop the batter into the frying oil with a spoon. Allow to cook on each side for about 90 seconds. Be sure to check on them, they burn fast! Set the donuts aside to cool. Enjoy! Using the method described above for a plain donut simply roll the donuts in cinnamon and erithrytol directly after removing from the frying oil. Use the method described above to make plain donuts. Cut each slice of bacon into 4-5 pieces. Cook until crispy in a frying pan. When the bacon is done add half the maple syrup to the pan and turn off the burner. Allow the syrup to develop a coating on the bacon for 3 minutes. Place bacon on top of plain donuts. Drizzle with the remaining maple syrup. 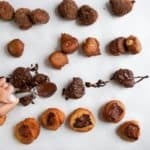 Use the method described above to make plain donuts with the exception of adding 2 tbsp of cocoa powder to the dough and removing 1 tbsp of carbquik. For the chocolate drizzle melt 1oz of an unsweetened chocolate bar with 1 tbsp erythritol and microwave for 30s. Stir mixture and microwave for an additional 30s. Drizzle on top of donuts. Use the method described above to make plain donuts with the exception of adding 2 tsp of pumpkin pie spice to the batter. For the cream filling combine pumpkin puree, cream cheese and liquid stevia and mix until creamy using a hand mixer. Pipe the filling into the donuts using a pastry bag or a squirt bottle.